Comparing and merging datasets are typically time consuming operations when data volumes increase: the traditional approaches to either load data into a staging table and compare the content against its destination table or using an ETL tool to run the compare both have a downside: there is a lot of data movement going on. You have to touch the data at least twice. When you have to design a solution that can handle large volumes of data or when you are running out of time already there is an alternative! 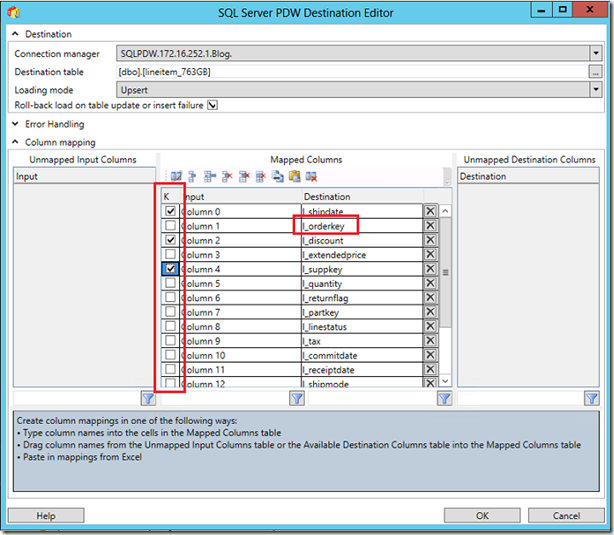 The Microsoft Analytics Platform System (APS) offers a very powerful feature to Upsert data (=insert or update), read from a flat file or ETL data source directly, into a distributed table with just a single command: data gets loaded at maximum speed into multiple small temporary tables and each of them will get merged in parallel against the final destination table distributions without locking the destination table! To start at the beginning, let’s look into the merge concept in its basic form: imagine you have to update a table to accurate reflect sales information details; when products have been returned to a store and money has been returned to your customers this means the sales history table needs to be updated accordingly. 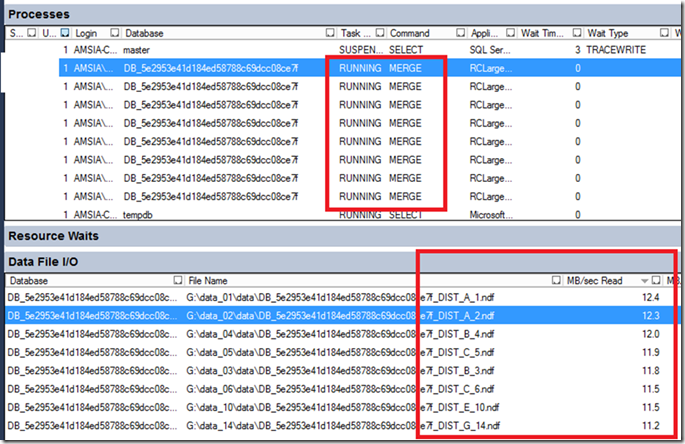 Typically you will load all incoming sales records into a staging table or ODS and update the DWH at a later stage with a merge command (a great feature that has been introduced in SQL2008). This means you will read all the new sales transactions you have received and for each new order number a record will get inserted into the destination table and, when an order number already exists, the entire record needs to be compared and updated accordingly. With a single APS DWLoader command you can start a direct merge on any given key column specified with the -K option to base the merge on: If the merge key exists in the destination table, the row is updated. If the merge key doesn’t exist in the destination table, the row is appended. Status: Error, Run Id: 119 – Error Code: 8672 – Message: The MERGE statement attempted to UPDATE or DELETE the same row more than once. This happens when a target row matches more than one source row. A MERGE statement cannot UPDATE/DELETE the same row of the target table multiple times. Refine the ON clause to ensure a target row matches at most one source row, or use the GROUP BY clause to group the source rows. [2015-06-18 22:03:07] Load has Failed. The chance that this will happen in the real world is pretty large so we will have to take precautions by selecting multiple columns to form a unique key which should represent a unique row. This way, when there are multiple updates to the same record we will record and keep them both. It’s time to pull out the 75GB/600 Million lineitem flat file once more and merge the contents with a 763GB CCI table. With the upsert –m option specified APS performs and commits loads in parallel and a merge operation will be executed for each distribution table. (Note: without this option only a single merge operation will get started per APS compute node and to process the 8 distributions sequentially, the merge phase will take 7 times longer). Via the APS admin console we can track the progress and the merge operation on 600 million rows only took 31 minutes in total to complete! 5minutes 17seconds to stage the data (DMS_LOAD phase), followed by 26 minutes to merge the data and insert 600 Million rows (LOAD_INSERT phase) on a 4 node APS. The duration of the LOAD_INSERT phase will depend on the size of the destination table and the quality of the data (please read the paragraph below on trailing spaces!). 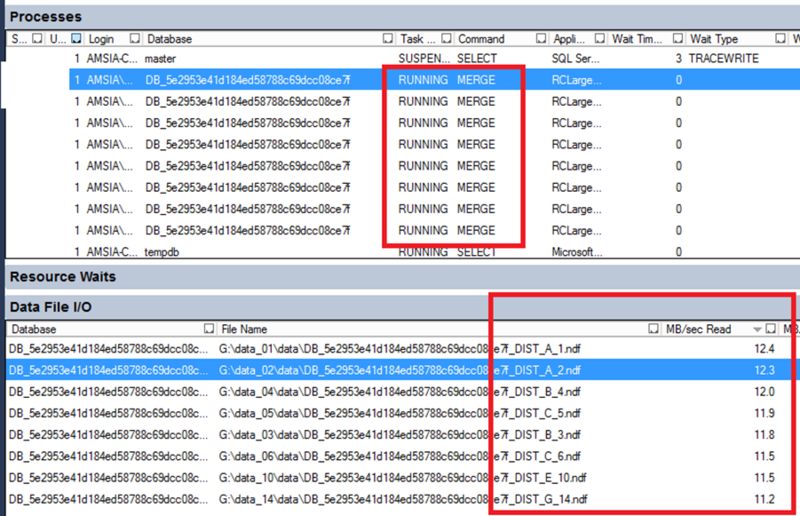 During the CREATE STAGING phase an empty table with the DDL copied of the destination table is created which will be dropped during the LOAD_CLEANUP phase. All 8 distributions in each compute node will run a merge statement in parallel. Most data will typically be in memory already with APS, but just by monitoring SSMS I’ve seen 270+ MB/sec of data being read from disk per compute node when needed. Besides the dwloader utility to read from (gzipped) flatfiles you can also use the SSIS PDW Destination adapter or Informatica’s Powercenter to integrate the upsert functionality into existing ETL processes. [SQL Server PDW Destination ] Error: An error occurred with the following error message: "The server could not initialize the load. Details: The KeyColumn parameter must include the Distribution Column when doing an UPSERT operation". Merging a ~400GB file with 1Billion rows that primarily contains record updates and many spaces, like shown in the picture above, against a 7.2 Billion row table completes within 4.5 hours; where ~3 hours extra is needed to remove the spaces at the source. If you spend a lot of time to execute data merge operations it might be worth checking the source data of your most time consuming jobs for trailing spaces; a quick win might be around the corner! When you see the amount of data to process coming your way is steadily increasing or you when have to reduce the amount of time it takes to merge data quickly, consider the Massive parallel processing (MPP) data merge capabilities of the Microsoft Analytics Platform System (APS) to handle lots of data, all in one shot, for you! Thanks for another amazing article Henk. I am just curious, do you know if we will ever see DWLoader.exe being able to use a BCP format file ?